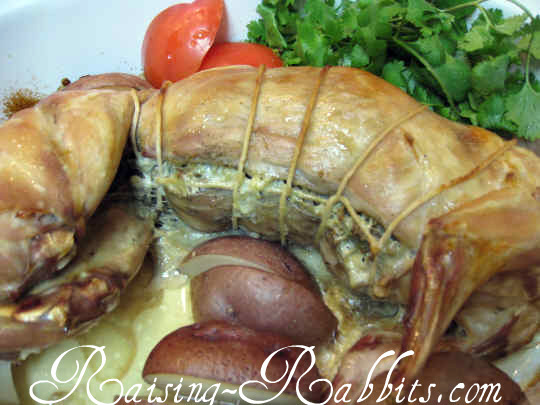 Stuffed Rabbit Recipe. Was your thanksgiving turkey small? Got extra stuffing left over? 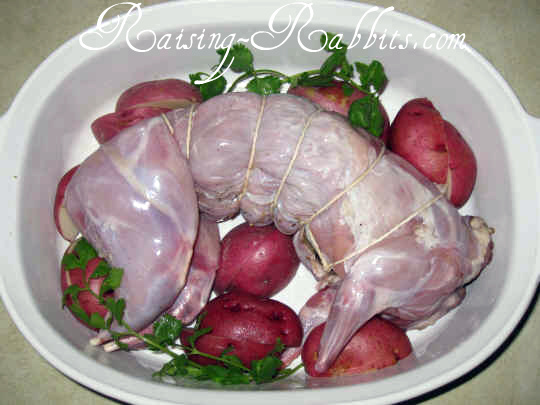 No problem - follow this stuffed domestic rabbit recipe. Mmm ... delicious. Use your favorite homemade turkey stuffing to fill the cavities of one or two rabbits. (We had enough stuffing for one rabbit.) You can, of course, fill as many rabbits as you have stuffing for. Bake the rabbits in the oven. This also makes a great crock pot rabbit recipe. But, nothing says you have to wait for Thanksgiving to prepare a stuffed rabbit. Whip up your favorite stuffing in any season and enjoy a very healthy meal. Stewing it all day in the crockpot while you’re away at work is a great way to simplify your life. You’ll come home in the evening to an entire meal-in-a-pot. Preheat oven to 350 deg. Fahrenheit. Rinse one or two fresh rabbit fryers. Prepare your favorite turkey stuffing recipe. Stuff the lung and the abdominal cavity with the turkey stuffing. With cooking twine, tie the cavities closed. Rub rabbit with olive oil or melted butter. Add 1 cup of water or chicken broth to casserole. Cover casserole, and bake for 1 1/2 - 2 hours or until done. This stuffed rabbit recipe can also be cooked in the crock pot. Include the veggies and cook on ‘low’ for 6-8 hours, or until done. Rabbit fryers are very lean and carry less moisture than poultry. Adding a bit of broth and a tablespoon or two of butter will improve your enjoyment of this dish without sacrificing health benefits. See Rabbit Starvation for more information.